The Genesee Brewery, New York State&apos;s oldest brewery, recently resurrected and illuminated its popular beer keg tree, marking the third year for the holiday tradition. The towering two-story tree, made of 11 rows of 430 empty, stainless steel beer kegs, now stands 26 feet tall in the Genesee Brew House parking lot. Topped with a rotating Genesee Brew House Pilot Batch neon sign, the tree is adorned with over 2,000 feet of twinkling lights, which at times, synchronize with holiday songs. With hundreds gathered at the Genesee Brew House, the tree lights were officially lit up on Friday, December 2. As the keg tree sparkled, Genesee marked the occasion by presenting their loyal, beer-loving fans with an exclusive, unique brew – a Bourbon Barrel-Aged Imperial Black IPA. The limited release beer is Genesee Brew House&apos;s original Imperial Black IPA aged for 12 months in wet Kentucky bourbon barrels. 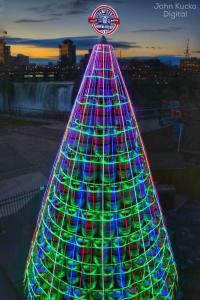 "The Genesee Beer Keg Tree has become a holiday tradition in Rochester and throughout the area. People come from all over to see the tree, and take photos," said Carrie Duggan, brand manager, Genesee. "This year, we tapped a special bourbon barrel-aged ale to commemorate the special evening, and kick-off another holiday season." Each year, thousands of people flock to Rochester to see the unique tree which the brewery said started as a simple employee tradition. "It started out as a fun way for the employees to get into the holiday spirit," said Mike Gaesser, chief designer of the Genesee keg tree. "Now, it&apos;s become one of Genesee&apos;s favorite rituals. We take a lot of pride in bringing the keg tree to the next level each year. It&apos;s great to be able to bring beer and the holidays together in a fun way that everyone can appreciate." Each barrel was hand-filled with Genesee&apos;s Imperial Black IPA and stored at pristine temperatures. Every few weeks Dean would use a handmade pin contraption to taste test the beer – ensuring that it would be tapped at the optimal time. The result is a deep, dark ale enhanced by complex notes of toasted whiskey and bold vanilla from the Kentucky bourbon barrel aging process. It has an intense profile with rich caramel, roasted and black malt flavors that is balanced by the subtle earthy and floral tones of East Kent Golding hops. This limited edition ale will be on tap at select craft beer bars in the area. The Genesee Brewery recently began the first phase of a five-year plan to create an Eco-Brewery District. Phase one includes a $39 million investment to modernize the brewery and create one of the most advanced brewing systems in the world. Combining modern innovation with the experience and heritage of New York State&apos;s oldest brewery, Genesee will create a world class destination for beer and brewing on St. Paul Street in Rochester, New York. Established in 1878, the Genesee Brewery makes the classic Genesee line of beers, the Genesee Brew House Pilot Batch Series, the Original Honey Brown Lager and Seagram&apos;s Escapes. Pilot Batch Series beers are first brewed on the 20-barrel pilot system at the Genesee Brew House. The Genesee Brewery also manufactures beer and other alcoholic and non-alcoholic beverages under contracts on behalf of other companies. For more information: www.geneseebeer.com. Once a century-old packaging center, The Genesee Brew House has transformed the 9,200 square-foot space into a beer destination for upstate New York and beyond. The first floor of the Brew House features interactive exhibits, multi-media content, a retail shop and a pilot brewery complete with a tasting bar. Upstairs, there is a pub-style restaurant with a 41-foot bar (hand-crafted out of old, wooden Genesee brewing tanks), outdoor terrace seating and a rooftop patio. The Genesee Brew House tells a story of the Genesee Brewing Company that dates back to 1878. The brewery lays claim to being one of the oldest and longest continually operating breweries in the United States. By using an eclectic mix of vintage barrels, reclaimed wood, exposed ceiling, neon signs, new technology and modern exhibits, The Brew House will bring Genesee&apos;s story alive for generations to come.